Someday. Someday years from now. When I have kids. When I’m rich . . . It’s easy to put off the creation of a will, but the fact is, your procrastination is only hurting you, your loved ones, and your future. So let’s get started! Creating a will is not as complicated as you might imagine, and it’s the first step toward building a comprehensive and effective estate plan. However, before you sign on the dotted line, there are a few important things to know about writing a will . . . Although wills come in different forms with different levels of complexity, there are a few basic requirements that must be met in order for the will to be valid. First, you must be 18 years or older. Second, the will must be executed with sound mind and mental capacity. Third, the document must clearly state that it is your will. Fourth, you must sign and date the document. Fifth and finally, two competent, adult witnesses (who understand what they are witnessing and don’t stand to benefit from the will) must sign it and watch each other sign it, all in your presence. Before you begin the process of actually creating the will, you’ll need to answer a few basic questions. Think about these questions before you meet with an attorney, and then ask any clarifying questions or voice any concerns you might have at your appointment. Who will you name as your executor? 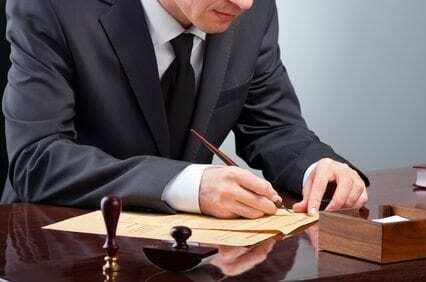 The executor is responsible for settling your estate after your death. This could be a lawyer, accountant, financial advisor, spouse, family member, friend, etc. If this person is under the age of 18 or has been convicted of a felony, they are ineligible. Who will you give power of attorney? A general power of attorney appoints someone to handle your finances and property while you are still alive. They will do this if you are out of the country (and you ask them to help with financial affairs) or if you are physically or mentally incapable of managing your affairs. You should also consider making a health care power of attorney, which appoints someone to make medical decisions for you if you are physically or mentally incapable. What are your assets? If you don’t know what you have, how will you know what to do with it? So before you meet with your lawyer, take an inventory of all of your assets. Bank accounts, investment accounts, retirement funds, cash, and real estate are all common assets, but don’t forget about digital assets, intellectual property, copyrights, royalties, and other valuable objects (cars, jewelry, furniture). Who are your beneficiaries? The beneficiaries are the people (or organizations, charities, trusts, etc.) who will inherit your assets. Be sure to choose secondary or contingent beneficiaries as well. They will inherit your assets if the primary beneficiaries die or do not meet a required condition (such as age). Who will be your children’s guardian? If you have minor children, you will need to designate a guardian for them. If one parent dies, the other parent usually receives custody of the children, but if that parent is unfit or both parents pass away, the court will need to decide who receives guardianship of your children. There are many other important things to know about writing a will, but this should give you a great starting point. So . . . are you ready to begin? To learn more about your options and the process of writing a will, contact the attorneys at Carnahan, Evans, Cantwell & Brown if you live in or near Springfield, Missouri. Our Estate Planning Group would be happy to help you create a will, whether simple or complex, that fits your unique situation. For more information, please give us a call at 417-447-4400. We look forward to hearing from you!